When it comes to the Italian beef sandwich, two Chicago establishments are clearly the front-runners. 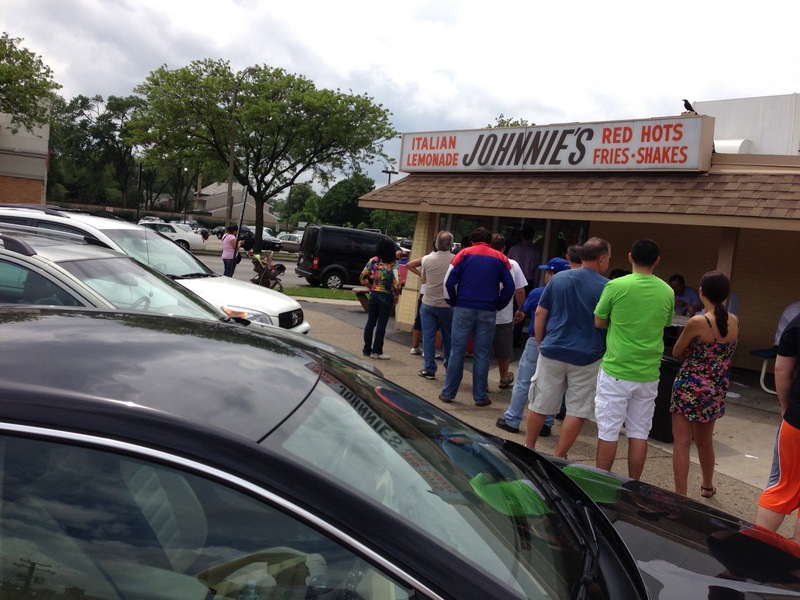 Chicagoans are loyal to either Al's Italian Beef or Johnnie's Beef. And I'll proudly saw that I chose the later. Johnnie's Beef which is located in Elmwood Park has become one of those old-time restaurants that hasn't skipped a beat. They still have a simple menu that includes just a few items--italian sausage, italian beef, a combination of both, and red hots. Rather than adding as the years have gone by, they keep just one italian ice flavor... lemonade. And somehow, the line keeps growing. The food is perfection; I could easily see myself eating here several times a week if it wasn't for its location. Anyway, after careful consideration, I couldn't think of any reason to not give Johnnie's a perfect 5 mile rating. The line at Johnnie's Beef just shows how good this place is. People will wait for perfection! It is fine to see how people order their Italian beef or combo sandwich. I say "Combo, both, juicy." That translates to "italian beef with italian sausage sandwich, add both sweet peppers and hot peppers aka giardinera, and dip that italian bread roll into the beef au jus. This is my perfect sandwich and Johnnie's does the best at making it. The bread is always soft and eventually on the soggier side from the au jus. 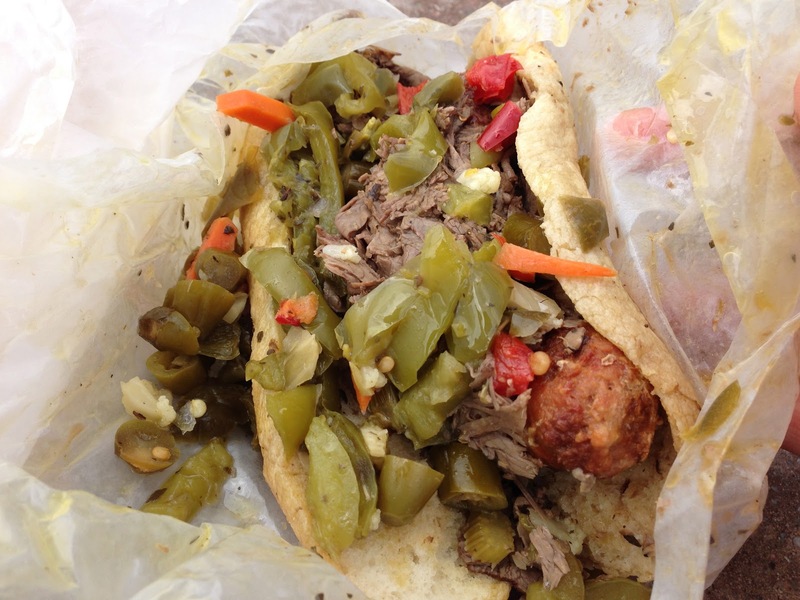 The italian beef and italian sausage are perfectly seasoned and can be eaten on their own. And, the combination of hot and sweet peppers gives a nice, crunchy texture and a little sweet undertone. I always suggest ordering both the beef and sausage because the meats compliment each other really well. I sometimes find the italian beef to be on the saltier side and the sausage on the smaller side. So together, the sandwich becomes epic. This is one of the sandwiches that is a must try when in Chicago. The french fries are nothing special. They are served piping hot with not much salt. They are reasonably priced, but I probably wouldn't waste stomach real estate for them. Much better than many of the other italian beef places' fries. I love Italian Ice and I think Johnnie's has some of the best. They have one flavor... lemon or lemonade. I specifically like this italian ice because they don't use as much lemon rind as some of the other places. They have a good sour to sweet ratio and are very generous with their portion. I suggest ordering a small because they make a huge mound above the cup. Delicious and a must try! Seeing tamale on the menu was intriguing. I decided to give it a try rather than ordering fries. 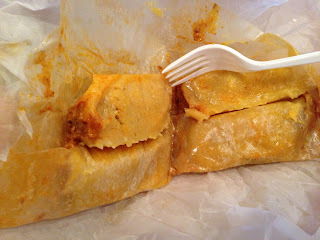 It was a ground beef or in my case, mush, tamale. The massa was good consistency, but it was more bland than anything. I had to eat it with the left over hot peppers that fell out of my sandwich. Probably wouldn't order it again, but this sub par dish cannot put a blemish on how perfect I think their sandwiches are. - I prefer coming on off hours... because there is always difficult finding parking and a long line. - Do specify if you want it juicy or dry. Getting it to go is usually better dry. - Don't plan on eating at the restaurant. They have about five tables which are always full and a small counter to stand up and eat inside. Just get it to go.